Men without Work. The political economist, Nicholas Eberstadt, has pointed out that the work rate for prime working age (25 – 54) men has dropped from 94.1% in 1948 to 84.3% in 2015. 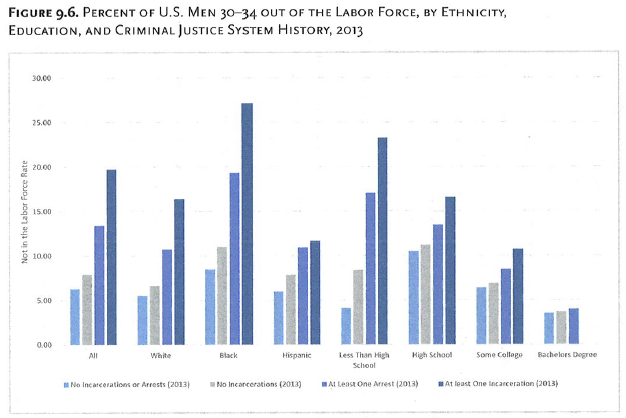 This translates into 9.5 million prime working age men who are not currently in the workforce. Complacency. The economist, Tyler Cowen, makes a strong case that too many Americans are so comfortable in their own worlds that they have become complacent about the structural problems facing American society. Segregation by Class. 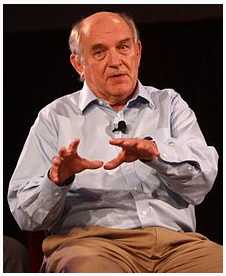 The political scientist Charles Murray has described a separation of American society into a new Upper Class (20% of all Americans) and a new Lower Class (30% of all Americans) with the Upper Class enjoying the four deepest satisfactions of life: family, vocation, community and faith while the Lower Class is largely left out. Greatly improve vocational training for the millions of skilled jobs for which there aren’t enough qualified applicants. Revitalize America’s job-generating capacities. More businesses have closed than opened each year since the Financial Crisis. Reverse the perverse disincentives against male work embedded in our social welfare systems. The Earned Income Tax Credit should be extended to single adults without dependents. Eligibility for disability income should be tightened considerably. Come to terms with the enormous challenge of bringing convicts and felons back into society. The huge increase in incarceration rates in recent years has coincided with a dramatic drop in rates for both violent crime and property crime. Conclusion. 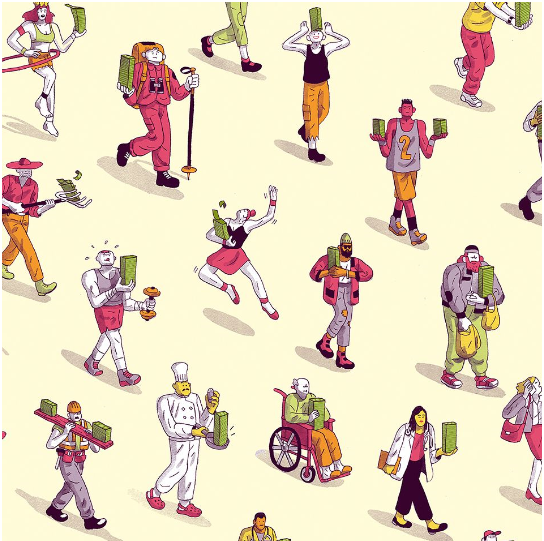 It’s a scandal that so many blue-collar workers are struggling to live a fulfilling life. There are many different actions government can take to improve their lot. Every once in a while we should step back from our country’s everyday problems and look at the bigger picture. In my last post I pointed out that, while there has been enormous human material progress around the world in the last two hundred years, some prominent thinkers say that the U.S. is now mired in complacency and is at great risk of deteriorating. The collapse of a sturdy moral code. It has lost self-confidence in the rightness of its own customs and values (marriage, industriousness and civic engagement) and preaches only non-judgmentalism instead. Unseemliness. 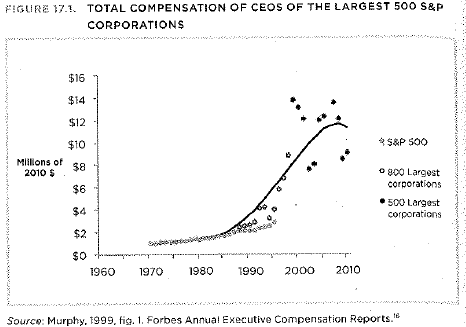 CEOs make increasingly enormous salaries and receive incredibly huge separation bonuses. Also, hundreds of billions of dollars in government funds are up for grabs as contracts or tax expenditures. Drifting towards the European model of more welfare paid for with higher taxes because paying taxes is a cheap price for a quiet conscience. Watching the European model implode. As publicly financed benefits grow, so do the populations who think they need them, and the fewer people there are in the private sector to pay for them. There is no way out of the self-destructive dynamics of the welfare state and America is watching this happen first in Europe. The increasing obviousness of an Alternative. Mr. Murray proposes that our current welfare state be replaced by a guaranteed annual income of $10,000 (in 2002 dollars) for all, phased out at incomes above $25,000. The idea is that such a proposal will become increasingly desirable as our welfare state becomes increasingly unaffordable. The resilience of American ideals. Mr. Murray believes that a civic Great Awakening will take place among the new upper class. He believes that American exceptionalism has a historical basis and that the qualities of industriousness, neighborliness and self-confidence will reassert themselves and put the ‘American Project’ back on track. Conclusion. Regardless of the specific details of what he foresees, Charles Murray is an optimist and so am I. The main topic of this blog is U.S. fiscal and economic policies and especially, how, and to what extent, they are lacking. But every so often I take a broader perspective. For example, the Swedish economist, Johan Norberg, has described in detail the remarkable human progress of the past 200 years, starting with the industrial revolution. The British scholar, Matt Ridley, has given a cogent explanation of what brought about all of this progress. Conclusion: human life, overall, has improved dramatically in the last 200 years and most likely will continue to improve well into the future. How are things going in the U.S.? Not so well, relatively speaking, according to the economist, Tyler Cowen. He thinks that too many Americans are so self-satisfied with enjoying the fruits of prosperity that as a society we have become complacent about many hidden, but very serious, problems, such as debt, deteriorating life conditions for blue-collar workers, and a huge buildup of internet crime. This complacency is likely to make America less dynamic in the future. The eminent political scientist, Charles Murray, has weighed in on this issue with his tour-de-force tome, “Coming Apart: The State of White America 1960 – 2010.” Mr. Murray describes a new kind of segregation which has developed in the U.S. based on socio-economic class, largely fueled by educational attainment and professional status. The new Upper Class (20% of all Americans) are largely separated from the rest of society not only by the neighborhoods where they live and their professional employment but also because they are more likely to be married, hardworking and engaged in society. The new Lower Class (30% of all Americans) has just the opposite characteristics of the Upper Class. Mr. Murray argues that the four sources of deepest satisfaction in life are: family, vocation, community and faith and that these four main sources of satisfaction have become enfeebled for the Lower Class over the past 50 years. But the Upper Class is also being hollowed out in other ways. Conclusion. “Great nations eventually cease to be great,” observes Mr. Murray. Is America doomed to moral deterioration and decay? Stay tuned! A Guaranteed Income for All: Good Idea or Bad Idea? Every American citizen age 21 and older would get a $13,000 annual grant deposited electronically into a bank account in monthly installments. $3000 would be applied towards health insurance. UBI is financed by eliminating all other welfare programs: Social Security, Medicare, Medicaid, food stamps, housing subsidies, aid for dependent children, etc. as well as agricultural subsidies and corporate welfare. People can make up to $30,000 a year without losing any part of the grant. Above $30,000 in earned income, the grant decreases to $6500 when the income reaches $60,000. The $6500 retained by all compensates for losing Social Security and Medicare. The overall cost of UBI will be $200 billion per year less than the current system. By 2020 UBI would be nearly $1 trillion per year cheaper. It would probably discourage work. Right now 80% of Americans in their prime working years, 25 – 54, are employed. Work is not just what people do for a living, it organizes people’s lives. Making work more optional would impair this basic social structure. A UBI divorces assistance from need. For example, a housing voucher could lead a family to move to a better neighborhood. A basic monthly income would probably not. More generally, a single parent with several children would be strapped to get by for $10,000 per year without any additional welfare assistance. We can’t let the kids starve. Conclusion: UBI appears to be an attractive way to simplify our vast welfare system and would save a significant amount of money (always important). But the poor would not be well served. There are better ways to reform our public assistance programs. I have written several posts recently, here and here, about the need for faster economic growth in the U.S. and how to achieve it. Part of the problem is the huge size of the federal bureaucracy and the enormous and rapidly growing number of rules which they issue each year. 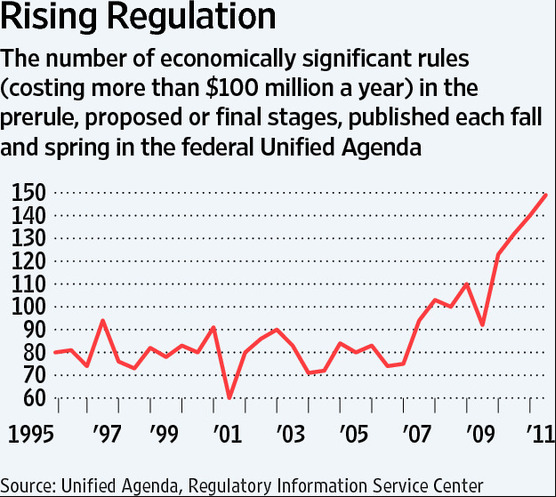 Federal regulatory cost reached $1.885 trillion in 2015, which averages out to $15,000 per U.S. household for just one year. This exceeds the $1.82 trillion which the IRS is expected to collect in both individual and corporate income taxes in 2015. In 2015, 114 laws were enacted by Congress while 3,410 rules were issued by agencies, 30 rules for each law enacted. Some 60 federal departments, agencies and commissions have 3,297 regulations in development at various stages in the pipeline. 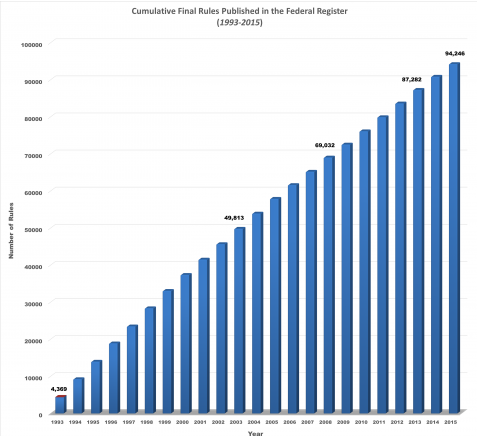 The 2015 Federal Register contains 80,260 pages, the third highest page count in history. The George W. Bush administration averaged 62 major (having an economic impact exceeding $100 million) regulations annually, while the Obama administration has averaged 81 major regulations annually over seven years. Another intriguing approach to attacking regulatory overkill is given by Charles Murray in his new book, “By the People, rebuilding liberty without permission.” The point is that there are measures which can be taken to address this particular aspect of our slow growth problem. Donald Trump is having a huge impact on the 2016 U.S. presidential race and lots of people are trying to understand why. In a previous post I wrote that the Republican Party needs to figure out where all of the Trump supporters are coming from and then try to keep these people under a perhaps larger Republican tent. The long time American Creed of egalitarianism, liberty and individualism is losing its authority and its substance. One of the most widely acknowledged aspects of American exceptionalism is the lack of class consciousness. This lack of class consciousness has now been replaced by the emergence of a new upper class, a new lower class and the plight of the working class caught in between. The new upper class is characterized by its condescension toward ordinary Americans. Mainstream America is fully aware of this condescension and contempt and is irritated by it. It may mean that American egalitarianism is coming to an end. In the 1960s, white working class men in their 30s and 40s were almost all working and almost all married. 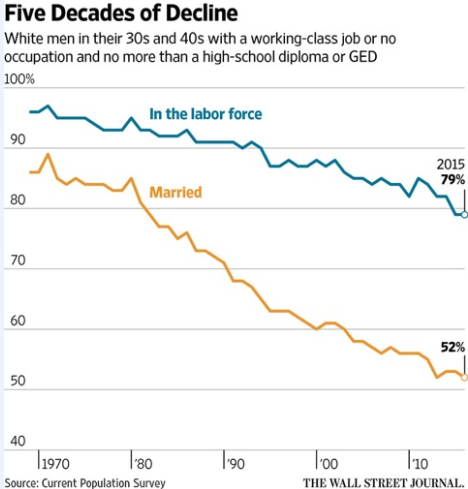 But, as shown in the chart, these high labor participation and marriage rates have dropped dramatically in the past 50 years. The success of the civil rights and feminist movements, both classic invocations of the American Creed, have led to a large scale ideological defection from the pillars of liberty and individualism. The problem is that affirmative action demands that people be treated as groups. Equality of outcome trumps equality before the law. By the 1980s Democratic elites largely subscribed to an ideology in conflict with liberty and individualism. This produced the Reagan Democrats. During the past half-century, American corporations exported millions of high-paying jobs while the federal government allowed the immigration, legal and illegal, of tens of millions of competitors for the remaining working class jobs. I have just been reading a fascinating new book by Charles Murray, “By the People: rebuilding liberty without permission,” describing how the U.S. regulatory agencies were created and the many abuses they impose upon us. As Mr. Murray explains, a Regulatory Agency first promulgates substantive rules of conduct. A complaint that an Agency rule has been violated is then prosecuted by the Agency and adjudicated by the Agency. If the Agency ultimately finds a violation, then and only then, the affected private party can appeal to an independent judicial court. But an Agency decision, even before the court, possesses a very strong presumption of correctness on matters both of fact and law. Mr. Murray proposes a new standard that “All regulations that are arbitrary, capricious or an abuse of discretion are automatically eligible for civil disobedience.” To this end a private legal-aid foundation should be set up to provide legal assistance to ordinary Americans who are being victimized by the regulatory state. It would be funded by what Mr. Murray refers to as the Madison Fund. A $100 million endowment from a wealthy individual would be sufficient to get it started. To defend people who are innocent of the regulatory charges against them. To defend people who are technically guilty of violating regulations that should not exist, by drawing out the litigation as long as possible, making enforcement of the regulations more expensive to the regulatory agency than they’re worth and reimbursing fines that are levied. To generate as much publicity as possible, both to raise public awareness of the government’s harassment of ordinary people and to bring the pressure of public opinion to bear on the problem. The goal is to achieve a “No Harm, No Foul” regulatory regime. A good analogy is to force regulators to use the same strategy as used by state troopers on interstate highways. A majority of drivers are engaged in civil disobedience just about all the time. But normal practice is to stop only those people who are driving significantly faster than the flow of traffic or are driving erratically.